The Ford Transit connect changed the face of small vans on the market. For many it’s a bigger alternative to the Citroen Berlingo and even competes with the large panel vans. If you’re looking for a solidly-built workhorse then the Ford Transit can offer you great quality with its renowned high standards. The functional design gives an indication of just how brilliantly practical this van is. With the choice of both a short and long wheelbase, body styles and a versatile loading bay you can easily understand why the Ford Transit Connect is regarded as ‘the whole package’. Whether you’re driving long-haul or just making short journeys, the Transit Connect stays faithful with its pleasant driving position and its agreeable engine. The ride is impressively smooth for a van and can be driven with confidence on difficult roads with twists and turns, thanks to the high standard responsive steering. Standard features on the van include power windows and a remote control double locking system. If you would like to add a few more features to the Transit Connect you can choose from additions including voice control, bluetooth, auto headlamps and rain sensing wipers. Despite its function over design appearance, there has been great attention to detail paid to ensure that the cabin makes for very comfortable driving experience. The seating position for one is high, giving the driver a clear view of the road ahead, it can also be adjusted 6 ways. Another pleasing quality in the cabin is the clearly designed and easy to operate controls and you will find many useful storage compartments including a very handy A4 sized document holder. If you want to make the cabin feel more like a car, there are silver coloured interior applications and an optional colour scheme. On top of this there is an option available for folding passenger seats should you require to use the Transit Connect as a multi-purpose van. 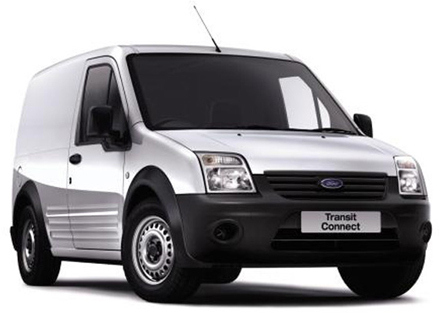 Got a Ford Transit Connect to sell?